Steve Troughton-Smith is now probably the most famous iOS tinkerer on the planet right now, and if there are any secrets to be picked out of the iPhone and iPad software then he will more than likely be the one to do it. So when he posted a short video to Twitter showing an unannounced and undocumented one-handed keyboard running in an iOS simulator, few of us were not even remotely surprised. According to him, the keyboard has actually been around since iOS 8, which means Apple was likely working towards having it ready for the release of the iPhone 6 and iPhone 6 Plus. Those two devices were the first of Apple’s 4.7-inch and 5.5-inch iPhones, and many had been worried that the increase in screen size would make typing a difficult proposition for those of us who were used to smartphones of the smaller variety. Apple obviously decided – for whatever reason – to not enable this keyboard feature for public consumption, but having watched the video made by Troughton-Smith, we can’t help but think that this might have been a mistake. Invoked via a simple swipe from the keyboard edge, the keyboard moves all of its keys to one side of the screen, making it easier to type single-handedly. Buttons for functions such as cut/copy/paste appear on the opposite side of the screen for quick access, too, making for even easier text entry for those who use such things. We can’t quite fathom why Apple has not made this keyboard available yet, especially considering its inclusion since the iOS 8 days. Apple must have plans for it in the future otherwise it wouldn’t be there now, but we wouldn’t want to guess when, or if, users will be able to take advantage of such a must-have feature as this one-handed keyboard. Meanwhile, Apple is also said to be flirting with the idea of an E-Ink based dynamic keyboard for its 2018 MacBook range, while the next year’s iPhone is said to sport an edge-to-edge display which will make the case for this one-handed keyboard feature even more interesting. LOL, I can imagine third-party app developers making a keyboard for iOS already. Is this available for the 6s??? 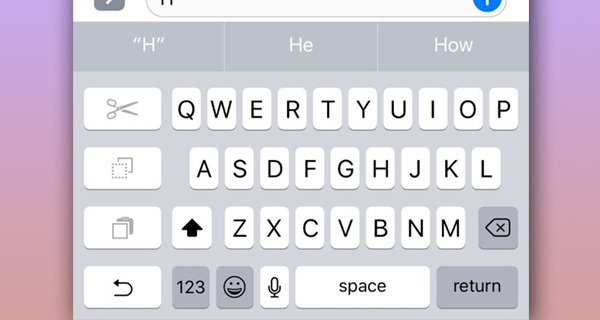 The keyboard is ‘HandyKey’ tweak available on cydia for jailbroken devices, been using it since 6+ came out.